Fossils keep revealing biomolecules that should be completely deteriorated and disintegrated if they are millions of years old. A collaborative group of German and Chinese scientists recently discovered what they believe to be the oldest fossilized-plant starch-based structures ever found. The starch is in the form of granular caps attached to the seed-like megaspores of an extinct plant called a lycopsid that supposedly lived during the Permian geological period. It’s believed that these starch structures acted as bait for arthropods to entice them to gather the spores and spread them around as a dispersal mechanism. In many types of living plants today, similar structures exist on seeds called elaiosomes that attract insects like ants. The fossils point to the Bible, not evolution. The presence of intact biomolecules in fossils found around the world defies the most basic evolutionary expectations, simply because they should be completely degraded by now if they are millions of years old. The best explanation for these discoveries is that the plants and animals represented by these fossils were the result of a rapid catastrophic deposition in a global flood as recorded in the Bible only about 4,500 years ago. The fossils point to the Bible, not evolution. Liu, F. et al. 2018. 280-m.y.-old fossil starch reveals early plant-animal mutualism. Geology. 46 (5): 423-426. Thomas, B. Ancient Animal Biochemicals Again. Creation Science Update. Posted on ICR.org December 7, 2017, accessed May 3, 2018. Thomas, B. Secrets from the World’s Best-Preserved Nodosaur. Creation Science Update. Posted on ICR.org May 15, 2017, accessed May 3, 2018. Clarey, T. Fossil Feather Proteins Confirm Recent Flood. Creation Science Update. Posted on ICR.org December 12, 2016, accessed May 3, 2018. Thomas, B. Scales, Colors, Proteins in Dinosaur Skin. Creation Science Update. Posted on ICR.org September 29, 2016, accessed May 3, 2018. Thomas, B. 2012. DNA in Dinosaur Bones? Acts & Facts. 42 (1): 15. Thomas, B. Did Scientists Find T. Rex DNA? Creation Science Update. Posted on ICR.org November 7, 2012, accessed May 3, 2018. Thomas, B. Fresh Fossil Squid Ink 160 Million Years Old? Creation Science Update. Posted on ICR.org June 20, 2012, accessed May 3, 2018. Thomas, B. 2011. Evolution Can’t Explain Organic Fossils. Creation Science Update. Posted on ICR.org December 15, 2011, accessed May 3, 2018. 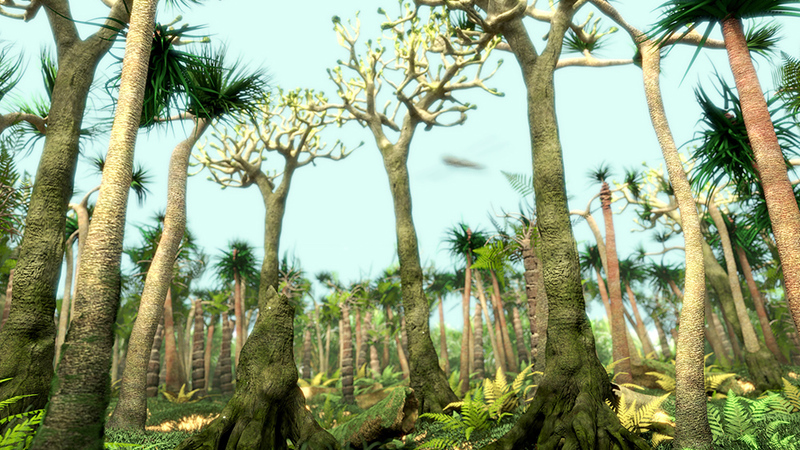 Stage image: Computer rendering of a carboniferous forest.